Roots of plants help hold soil in place, and prevent breakdown and erosion. Soil erosion is a natural process in which particles of soil are moved by wind and water, and displaced to another location. When erosion occurs naturally, soil is relocated at about the same rate it is created, so no harm is done to the environment. However, through development and agricultural processes, the rate of erosion tends to speed up and create harmful affects both to the natural land as well as to the people living there. The Ocean County Soil Conservation District works to control soil erosion by enforcing best management practices on work sites, along shorelines, and various other locations throughout Ocean County. Preventing erosion also prevents stormwater runoff, which will help keep the Barnegat Bay healthy as well as maintain its reputation as a valuable fishing location. Keeping soil erosion maintained will also keep soil off city streets, prevent the need to dredge lakes and rivers, keep harmful algae and weeds from growing, and provide a healthier environment overall. When not used properly, silt fences will not protect against erosion and stormwater runoff. The most natural and effective way to prevent erosion control is by planting vegetation. Roots from plants, especially trees, grip soil and will effectively prevent the excess movement of soil throughout the ground. A good way to imagine this process is by picturing two flower pots, one filled with nothing but soil, and one filled with a plant that has been growing in it for some time. If you flip the pots over, the one with only soil will create a huge mess, and soil will be displaced. 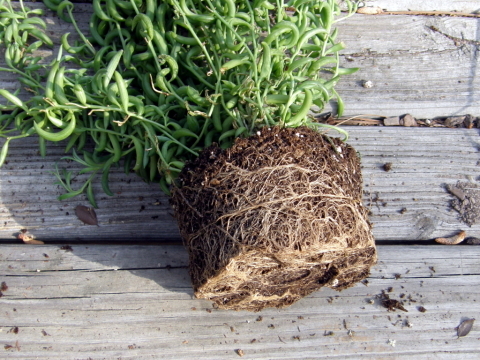 The one with the plant may lose some soil, but a majority of it will be contained in the root mass. 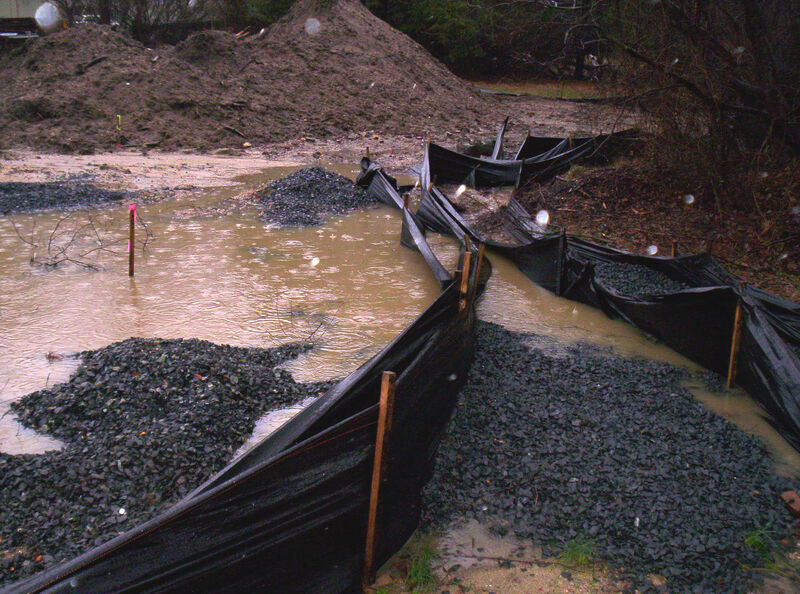 A popular erosion control method, especially at construction sites, is the use of a silt fence. A silt fence is a long fabric barrier that is installed along a hill, and collects any stormwater that would carry loose soil. The silt fence is installed several inches into the ground, and is meant to prevent any erosion until a lawn is put into place. To the right is an image showing the improper and ineffective use of a silt fence. You will notice that the fence is not secured properly into the ground, and stormwater can pass right through the barrier. This stormwater will eventually reach a river, lake, or stream, and will create murky water conditions which is very unhealthy for fish and other aquatic creatures. The photo on the top of this page shows the proper use of a silt fence in preventing soil erosion. 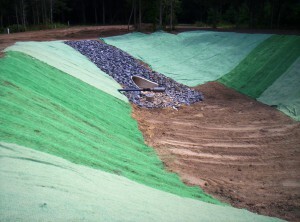 Erosion control matting is placed along the edges of a stormwater basin slope to prevent erosion and promote natural plant growth. Another effective technique used for soil erosion control is erosion control matting. Erosion control matting, as seen in the image to the right, is laid on top of loose soil and is secured into place. The matting remains in this location until native vegetation can begin to grow through, and does no harm to the environment. Erosion control mats provide the strength and surface area needed to protect an area from erosion or runoff. Shoreline restoration projects such as this one use recycled materials to strengthen the natural land along the water. Organizing a shoreline restoration project is a great way to re-build an erosion damaged shoreline and enhance the natural stability of an area along the water. Recycled materials such as tires, rocks and wood create a strong barrier for a shoreline that could normally suffer the impacts of erosion due to wave and wind damage. 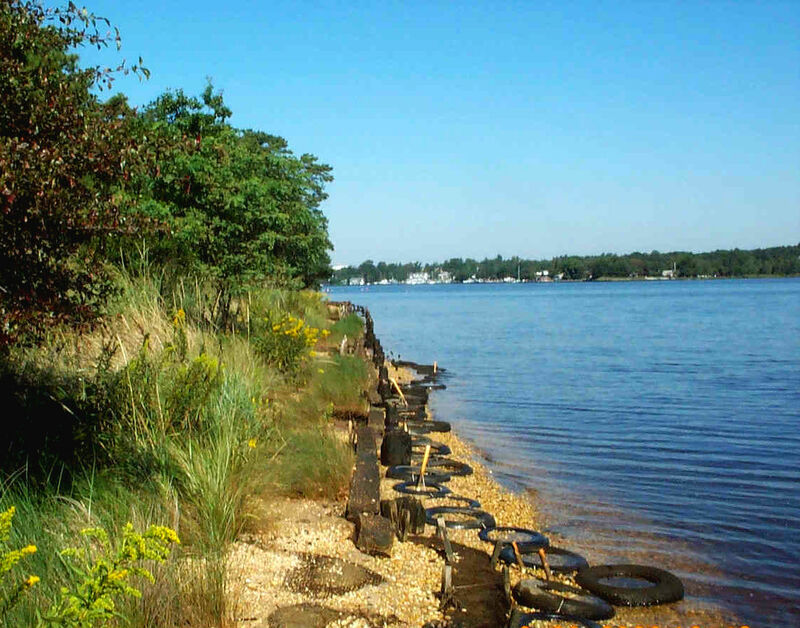 The photo to the left is a successful shoreline erosion project in Island Heights, New Jersey put in place through a partnership of organizations including the Ocean County Soil Conservation District. This project proved so successful that it even stood up to the strong impacts of Superstorm Sandy in 2012.